This page is only relevant to services still connected to the analogue PSTN, i.e. our traditional dial telephone network. Australian telecommunications systems are migrating across to the NBN digital transmission network, so at some time in the future (2020?) the PSTN will be shut down forever. After that time this article will simply become an historic curiosity. This note refers to traditional PSTN analogue telephone services on copper wire telephone pairs (NOT NBN). Remember that the Telco (e.g. Telstra) is responsible for the service up to and including the first socket. They may not take responsibility for internal wiring (e.g. extensions). 1. Is the telephone account paid up? If the line is disconnected, there is no point in proceeding! 2. Is there anything glaringly obvious? For example, is a Telstra team working in your street or is any of your telephony equipment unplugged or broken? Again, there is no point in proceeding until these things are resolved. I'm sorry to insult your intelligence but making sure something is correctly connected before we start is a primary rule of faultfinding! 2. Dial a chosen number. If the call is successful, i.e. speech is sent and received and there are no strange noises (crackles, hum etc.) you can be satisfied that the telephone keypad/dial, transmitter, receiver, the socket and the exchange line connection are ok.
3. If extension sockets are connected to the service, repeat (1) above at each socket and confirm dial tone is received and sounds the same. If the performance changes, the socket or its wiring may be faulty. 4. If known, call the number from another service, such as a mobile phone, and determine if the phone "rings" and it all works satisfactorily. If you don't have another service available, complete steps 5 and 6 from the phone in question to achieve the same thing. 5. Perform a ring-back call test (see test numbers below) to check operation of the telephone ringer circuit. 6. Confirm the number using “own number RVA” (see below) if this is required. 7. If all above tests are successful, the service is fully functional. Do these tests when dial tone is not received. 1. If a broadband computer service (ADSL) sharing the same line is still working this is not proof that the line is ok, as the high frequency broadband signals may transmit over a line with an open circuit fault (although the data speed may be degraded). 2. Unplug everything (including computer modems, filters etc) from the phone line making sure this includes from all extension sockets. Separate telephone lines (i.e. different telephone numbers) coming into the premises that are working ok can be left alone. 3. Leave everything unplugged for a few moments to enable the exchange to re-establish its line connections. 4. Again, plug in a known good telephone (and cord) to the first socket and listen for dial tone. Check at all other extension sockets in case the first socket has a connector fault. 5. If the dial tone is back, reconnect the other telephony/data equipment to the line one piece at a time to their respective sockets and check for dial tone after each piece of equipment is added. If at any point you lose dial tone, it's likely what you’ve just plugged in is the culprit. Check any suspect equipment at least twice to be sure it's not a coincidence. 6. If at (4) above you can't get dial tone on any of your sockets you can be fairly confident that the exchange line or internal wiring is at fault. 7. If you have access to another line (or a mobile phone), call the number and make a note of whether it returns ring tone, appears engaged or a recorded message is offered by the exchange. If it returns ring tone the line may be open circuit, if it is engaged the line may be short circuit. Listen to any recorded message to see if it is a Telco problem. 8. As a layman (layperson? ), you’ve run out of options so you'll need to report the fault to the Telco. Remember, they will probably charge you a call-out fee if they determine that the fault is in the customer terminal equipment (telephones, filters etc), so be sure of your diagnosis. Please forgive some of the non-technical language. This is a simple overview, not an academic document. A typical "copper" telephone line comprises a pair of insulated copper wires (usually called the A and B wires, although other terms may be used) that make a permanent connection between the telephone exchange equipment and the first socket in the customer's premises. A telephone cable comprises a number of pairs enclosed in a sheath. Modern cables use plastic insulation for the pairs and nylon, or similar plastic, sheaths. Old (PMG era) cables may have paper insulated pairs and lead sheaths. The cable pairs pass through numerous cross-connections along the route (Exchange MDF, cabinets, pillars, joints and customer sockets) thus numerous opportunities for faults to occur. Short circuit; where there is a contact between the two wires of the line. Sometimes called a "loop". Open circuit; one, or both, wires are broken i.e. completely disconnected. High line resistance; usually caused by corrosion on connectors. Allows some signal to pass but is not a "solid" connection. Low insulation resistance; in a perfect cable there is infinitely high resistance between the wires. LIR allows "leakage" of current between the wires. Earth contacts; one of the wires is accidentally connected to the earth (which is an electrical conductor itself). Unwanted electrical signals in the earth can "leak" into the line. Inter-pair contacts; Unwanted connection between wires of adjacent lines - may result in "crosstalk" between lines. “Foreign battery"; unwanted voltage from adjacent lines "leaking" into a line. Often caused by wet cable joints and the resulting low insulation resistance connections between pairs. Various combinations of the above; For example, earth faults on the two wires of a pair simultaneously result in a "loop and earth". Intermittent faults; any of the above that “come and go”. Accidental contact with electrical mains power is also a possibility. If this is suspected, isolate the equipment immediately and call an electrician. 1. Completely short or open circuits generally result in complete failure of the telephone service. Remember ADSL data may still operate over an open circuit line. 2. Unusually high line resistance or very low insulation resistance may result in low level transmitted/received signals. 3. Earth contacts on one wire usually produce a metallic “hum” on the line. 4. Intermittent bad connections (if they occur rapidly) may sound like “crackle” on the line. 5. Inter-pair contacts and/or "foreign battery" may result in "crosstalk" i.e. other telephone conversations "leaking" into the line. 6. Unusual high frequency tones may be ADSL control data on the same line (detected by the phone's electronics) that are not properly isolated or filtered from the telephony (see "ADSL filters" below). 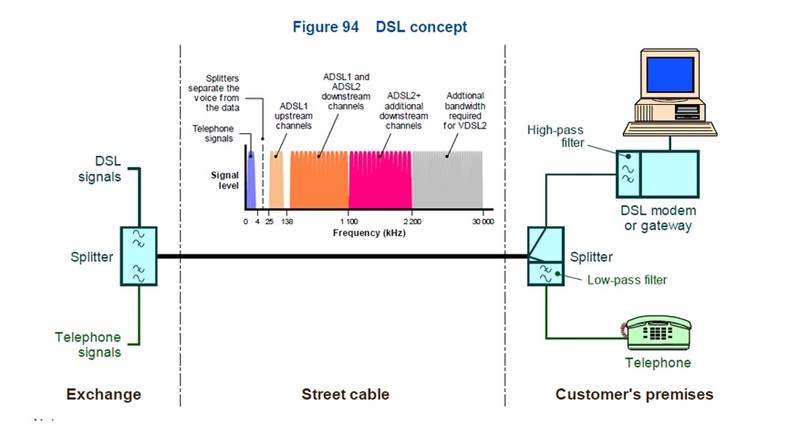 ADSL (Asymmetric Digital Subscriber Line) enables high speed computer (internet data) signals to be transmitted between the customer's premises and the provider's equipment over existing, copper cable, telephone lines. More information on ADSL can be found here. In simple terms, the digital data is converted to high frequency, electrical signals and transmitted in the frequency band above telephony. Electronic "filters" separate the telephony and internet data signals to ensure telephony devices (telephones, faxes etc.) don’t cause interference to the Internet signals and vice versa. In this way telephony and internet data can share the same line simultaneously. The following image from Telstra documentation describes the principles. If a phone and computer are co-located at a chosen socket, an ADSL splitter is required to separate the telephony and ADSL broadband; If no phone is required adjacent to the computer, the ADSL modem can be plugged directly into the socket. At all other sockets, telephony devices must be connected via an ADSL filter to ensure no interference occurs. Other configurations may be installed (e.g. central filter system) but the above splitter/filter arrangement will be effective in most cases. Australian legislation requires that ALL work on the public telecommunications network only be undertaken by authorised people. These include Telco employees on the network side and registered cablers on the customer side of a service. Nasty fines apply for breaches. The following notes are for information only but may be a useful refresher for an ACMA cabler not familiar with legacy systems. 1. A telephone circuit, from exchange to customer socket, essentially consists of a 50 volt DC source at the exchange and a two-wire line with a total resistance generally around 1000 ohms (but could be more or less). Go here to refresh your memory on how telephones work. 2. In the idle condition (i.e. phone is on-hook or unplugged) no current is drawn by the telephone, so the 50V DC is extended to the phone socket. 3. During incoming ringing, an AC ringing voltage of around 70 - 90 volts (at 17 or 25 Hz) is superimposed over the DC. 4. Lifting the handset (i.e. off-hook) operates the switch-hook circuit inside the telephone and the phone becomes a low resistance across the line. The DC current drawn is sensed by the telephone exchange and it stops the AC ringing voltage. The DC voltage drops to about 12 volts across the telephone instrument (this is simple Ohm’s Law – the 50V is divided over the line and phone resistances). During conversation, the audio is superimposed on this DC voltage. 5. At the end of the call the handset is replaced and the service reverts to the idle condition. A standard PSTN telephone service can be electrically tested quickly and simply. 1. Before you do anything else, test for line safety. Check for spurious voltages between the wires and earth. With a suitable cord, and voltmeter initially set to about 400VAC, check for unwanted AC voltage between the A and B wires and then each wire to earth. There should be no spurious voltages. Similarly with the meter initially set to about 400VDC check for unwanted DC voltage between each wire to earth. A few volts of "foreign battery" can be tolerated but if it's too high it is a problem. If spurious voltages are detected, tag and report to the relevant Telco (e.g. Telstra). 2. The line voltage between the A and B wires, with the phone unplugged (or on-hook), is typically about 50V DC (Although some PABX use lower voltages for their extension phones e.g. 24VDC). With a suitable cord and voltmeter, test for this DC voltage at the socket. 3. If you are really clever you can also check if the correct polarity appears on the terminals (the A wire [white] is +ve). This is usually not critical as a normal phone should work either way, but polarity was significant in some old style alarm circuits. 4. The next test is for line current. In a good circuit, this should be in the range of 20–100 mA, depending on line resistance (e.g. applying Ohm's law. If the total resistance was 1000 ohms, 50v/1000 ohms = 50mA). Again with a suitable plug and current meter connected between the A and B wires, test for this DC current at the socket. 5. If no spurious voltages exist, 50V appears at the socket and the line current tests ok then you can be pretty confident that the service is functional. 6. Plug in a telephone to check for dial tone. You can now go back to the start of this article! Jackson Industries is an Australian telecommunications and electrical equipment supplier. Their website gives good wiring information for Australian telephone plugs and sockets (although their descriptions of RJ11 plugs and sockets differ from some other sources, e.g.